Weather: Started a little wet, then fined up for the photos and parade, then bucketed down. Please if I have made a mistake with anyone being there or not being there please let me know and I will fix it immediately. Next big troop there will be a sign on sheet. So many people!!!! 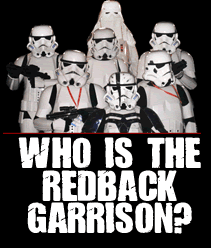 Mission: Raise money for the Starlight Foundation and amaze the locals of the Empire!!! Summary: Well what a day!!!! 37 Troopers in total. 35 Troopers in the parade. 34 in the group photos. A group of wranglers that were everywhere and a whole lot of fun that was had by all. The day started with bad weather but the sky cleared as we made our way to the fountain for a group photo. Wolf, SuperAzza and Hoppy lead the force donning their suits early to hit the front gate to start the day off. Success! Apparently they were stopping traffic. Then to the group shot where all got into the photo (except Tanya who was not happy but someone had to watch the kids…Muppet next year haha). Kenny Koala, Belinda Brown and Goldie the Clown, all of whom live at DW paid us a visit and got some photos as well. Some funny photos were had. Than we had Nick, Cobras little mate come in for a group photo, very cool. All the different units had their photos and then the fun started with the public. All troopers gave their all in the photo department on the day. All troopers volunteering more than a few times to get in on the action. In fact the number of troopers was meant to be 6 but most of the time we exceeded that to about 10. Wranglers did a fine effort controlling the crowd and handing out cards and flyers. Special mention to Wilza and Chief. I think they had a competition to see who could hand out the most cards to the most kids. Most kids were coming back for more. And also to Sheralyn as she just seemed to be everywhere at the photo areas. Brock you are going to be dangerous when you get your suit when you have the enthusiasm you have now. Then to the parade at 1130am. What a sight!!! 35 Troopers (Tanya got someone else to mind the kids. No way she was missing out on this one). In the compound all massed together was an amazing sight. A quick run down on marching from Scorp and putting everyone in place we were ready to go…5 minutes early. Everyone was so excited and pumped they all followed orders so well we ended up having to wait 5 minutes so we went out on time. Good work troopers. Then it was off to wave to the public. They came from everywhere to say hi and we even had the face painting fairies bringing up the rear looking after the kids that came in costume to which there were quite a few. Around the fountain we went and before you know it 35 troopers were cheering in the marshalling area and feeling pretty darn good. A quick shout to the Entertainment Department at DW who whooped and cheered and then went to the other side of the road to do it all again on the return trip home. Then back to the photo area to have more photos. Thought the area had to be changed due to the weather people were still coming over. One family in fact were stalking us so that they could get photos with every character. Great work all on the photo sessions. We had a great system (thanks Moxxie for co-ordinating there) and it seemed to work really well. Our roving patrols didn’t happen that much but that was due to the weather. The Spaniard and Rookie (who are we kidding he may as well change his handle to Sandy Andy) did brave the pouring rain to rattle the can with the Spaniard sister and girlfriend wrangling for them. Good job there guys. Now for some of the weirder stuff. A small force ventured into the Australian Wildlife Experience at the back of DW. Myself, Rents, Luke and the Wolf made or way with Wilza, Brock, Nick and Pez. I was lucky enough to feed the crocodiles not once but 5 times. Yes I did drop the stick the first go but it was really cool and fun to do. All the footage will be up soon I hope. Then we had photos with the Oakey Creek boys and then to the koalas. Wolf and Luke got to hold one but Rents couldn’t due to his Tie box. Luckily I spotted a python getting photos and before you know it all three lads were sitting down (no I wasn’t sitting) and getting photos. Not to be out done I had to get the python around my neck. Again very cool!!!! Then at 3.30 it was time to get the TB’s on the Motocoaster. Funniest thing I saw on the day. Muppet, Gremlin, Luke and Wolf all got to ride it in full kit. Hilarious to watch. Unfortunately Michaels back plate was a hindrance for him so he had to sit it out. Unlucky as well was the fact that both video cameras ran out of batteries so we only got still photos of it. Next year lads. Next year!!! By the time we got back the heavens had well and truly opened up. Troopers we soaked and getting tired. When the 3.30pm troopers came in at 4.00pm we decided to pull the pin on the photos as most people were leaving and the cameraperson (Rebecca Burton you rocked the whole day!) was getting her equipment wet. But what to do…..To AVPX!!! Alien vs Predator vs us. DW’s laser tag arena was a hoot. Most of us had buckets on so it made it really difficult but a lot of fun. Bec got some great photos of that as well. Well that was it time to pull up stumps. It was pouring rain, troopers were tired, the park was closing and most had a long drive ahead of them. Time to go….or so we thought. As I was buying my group photo at the Kodak shop a lady enters in tears asking where are the stormtroopers. Apparently she works in Brisbane and when she finished work she sped back down to the coast to pick up her 3 boys and see us at the end of the day. She got in when we were in AVPX and was beside herself. A quick phone call and a sprint (ok I was knackered by then so stumbling amble) and Moxxie in her ID, Scorp in his TK and me in my TD were in the marketplace having photos with the boys. Needless to say Mox and Scorp that was above and beyond. And FYI she bought a lot of photos from Kodak and put $20.00 in the tin as well. Bec was great making sure she got all the photos she needed. Amazing day. Amazing memories. Amazing people. To everyone involved well done. A couple of mentions though. Muppet and Moxxie for the effort they put into all the new troopers getting approved and their photos done. Without them we would be down at least 10 troopers for the day. records had to have been set!! Also Mox thanks for putting things on the website for me. Yes I do need some lessons. Kev for his behind the scenes work sorting out the Starlight stuff and listening to me stress a bit on the phone. Goose. Mate even though we didn’t the backdrops or banners up due to the conditions your efforts are really appreciated. And a big thank you for the lanyards again for another massive troop. Next year we will be bigger!! Dredd and Mel thanks for bringing the banners and Mel for making sure we didn’t have a big green pig to pick up off the floor haha. Ray from the Rebel Legion (do I dare thank him haha). Mate your wrangling and looking after Kev and general enthusiasm on the day was awesome. Most thought they saw a bit of the darkside coming out in you haha. To all the Wranglers thank you so much. With so many armour changes in the day and so many troopers to look after you all did a great job. To Pez and Nick we cannot wait to see what you have shot on your video cameras. Thanks and we all wait in anticipation for your footage. Good work lads. A big thanks to Rob Buchanan for allowing us to come to DW and hold this event. Let’s hope he gets us back next year!! Melinda Lloyd from the PR department at DW. She went above and beyond to make things happen and get the word out there. And to Jason Gearing for getting me on the radio a couple of times. Thanks you two!! And thanks for all you guys and gals that turned up. I hope I haven’t forgotten anyone. Don’t blast me if I did. Without the numbers that turned up it wouldn’t have been as spectacular as it was. Injuries: Other than the regular chafes and stiffness everyone came out of it only a little tired. I think that was mainly thanks to the great support team that just wanted to help all the time. Public Incidents: Funnily enough not 1 incident that I heard of. Unless you count me dropping the stick in the croc pen. Malfunctions: Hoppy blew a leg press stud out but other than that out of 37 troopers that was it. Hoppy was not happy!! Happy People: Everyone!!!! The public, the staff, the troopers and most importantly the DW management. Fingers crossed we get the gig next year so it will be bigger and better!!!! Not Happy People: I did not met anyone that was unhappy even in the rain. Well the WWW staff were upset we didn’t visit them. Next year maybe guys. Mission Status: Even with the weather being crappy which made donations down a little I think we were a massive hit and everyone held themselves very well and our behaviour was beyond reproach. Well done again everyone. PS See you all next year!!!!!!!! This entry was posted on Sunday, February 28th, 2010 at 10:08 pm	and is filed under Mission Reports. You can follow any responses to this entry through the RSS 2.0 feed. Both comments and pings are currently closed.